We had a visit from a FIDO Master, whom some of you will recognize from this photo, taken just as he announced "mate in three," playing black in a recent game where he employed the little known Russian Wolfhound Gambit to great success. 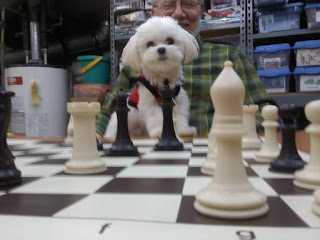 Gracious in victory or defeat, except for the occasionally over-exuberant moment when he is apt to seize upon his opponent's King and give it a good shaking, the FIDO Master's appearance at the board is a welcome sign to all. Renowned for their aggressive and vociferous approach to the game of chess, FIDO Masters are virtuosos at intimidating opponents. Occasionally going so far as demonstrating their disdain for an opponent’s blunder by lifting their leg on the errant piece. Unfortunately, The FIDO Master will not be attending any upcoming club meetings in the near future.. He’s been barred from local establishments after an unfortunate series of events best left unmentioned involving a rare steak, a lady's hat and a small child's ice cream sundae. For the time being, the FIDO Master must relegate his over-the-board play to non-food-related establishments, but he said he is looking forward to some chess sessions over cigars in the cabana.